My favorite time of the year has returned. This Saturday mom got out the big red stroller and me and the Lulu gots so excited!!!! We knew the stroller meant it was time for the farmers market. Every Saturday (when it's not too hot), we get go to the Pepper Place Farmers Market. 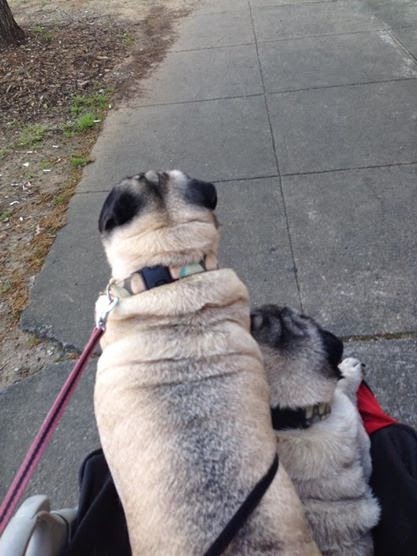 Mom pushes us around in our stroller so we can see all the peoples and so the peoples can see us. I sit at the very end of the stroller to protect the Lulu 'cause sometimes she gets scared. Mom says she's not afraid of everything anymore but I don't wants to take any chances! I's a good big brother that way. Hey Harry, we's at the farmers market! 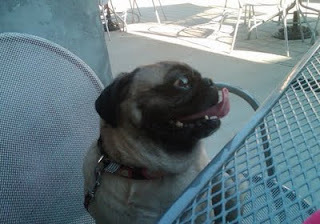 Mom said that when she was out at dinner Friday night she met some new peoples and the subject of us pugs came up. 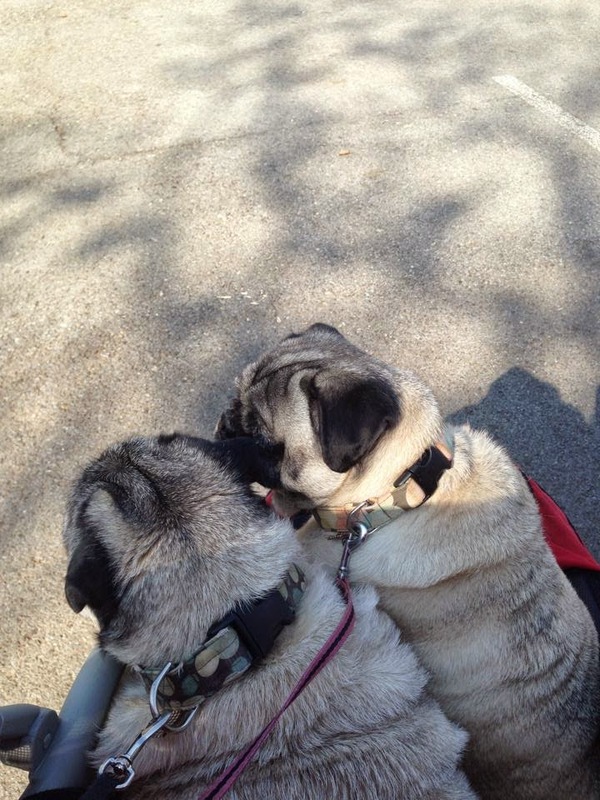 The lady started telling this story of how she met these adorable pugs last year at the farmer's market and they were in a red buggy. That was us! So, the lady said she'd had our picture as the wallpaper on her phone cause she thoughts we were so cute. Sadly, when she upgraded phones we got replaced by a cat. A cat!!!??!!! Anyways, we are so happy that the farmers market and our red buggy are back. 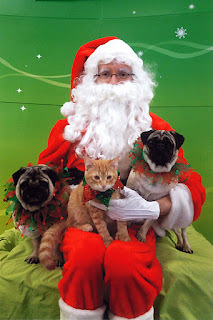 We hopes to see some other puggies there this year. Today is Harry's Gotcha Day! 5 years ago today I drove to Atlanta and adopted this little furry ball of love. That act brought so much happiness and friendship into my life. I met all of you - friendships I'll always cherish. So, sit back and enjoy this (kindof long) video of Harry's first five years. Here is is Tallulah Tuesday and I haven't posted in forever. And you know what I have to post about today? Harry. Can you believe it? Well, it's kind of a big deal because tomorrow is Harry's 5th Gotcha Day. That's right, five years since Mom first laid eyes on him in the fur and brought him home from Atlanta, GA. I wouldn't be so excited about it except that Mom says if it hadn't been for Harry she probably wouldn't have me, so there you go. Time to celebrate Harry some more. Well, I want to ask everyone for a big favor. Send that tubby boy some big Happy Gotcha Day wishes tomorrow, and if you're feeling generous, head over to SEPRA's website and donate a few dollars in his honor. 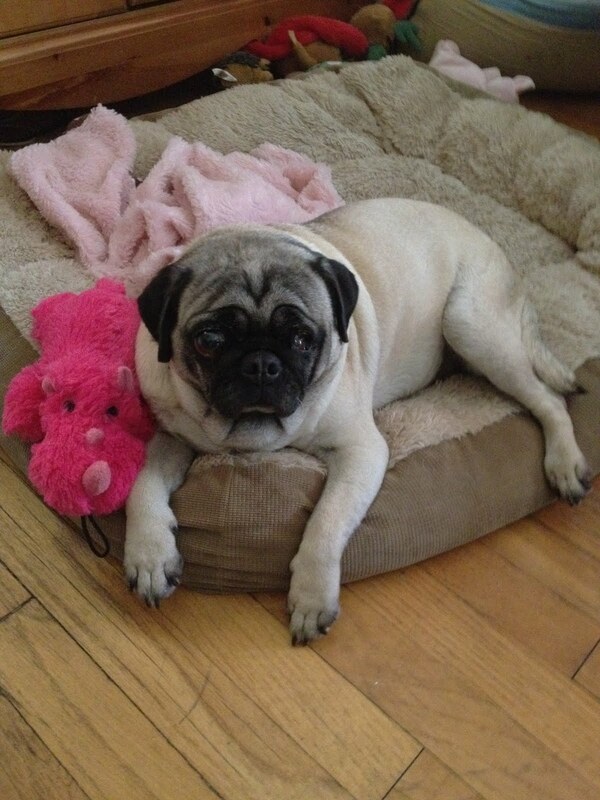 They've taken in quite a few pugs with costly medical issues lately so they can use all the help they can get. 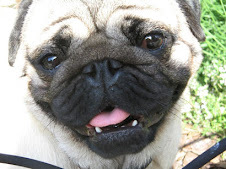 Hey there everypuggy. First of alls, the Momma has not been very good about letting me and LuLu get our paws on the computer to let everybodys know what's going ons with us. Well, we has lots going ons - but for now let's just talk abouts me. Yesterday was my birthday!!!!!!! I turned the big 6! Hard to believes isn't it?!?! 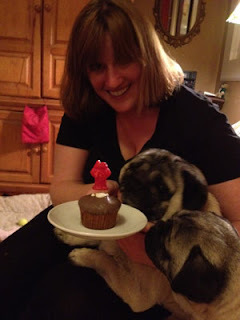 Mom was so excited about my birthday that she went and gots me my own pupcake and we had a little party last night. 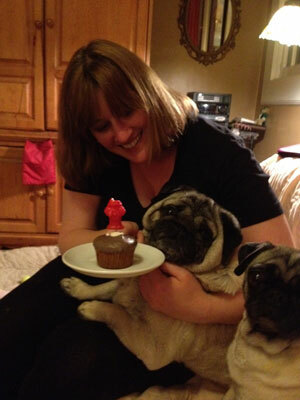 My Aunt Catherine who owns my favorite doggie boutique, Generation Dog, came over to help us celebrates. That was my pupcake. As you can see in this next picture, I immediately blew out that candle and was ready to dig in! Course, I had to wait... and then I had to share. Sheesh! Mom really made me wait a while so we could get a good picture with me not looking at the pupcake. 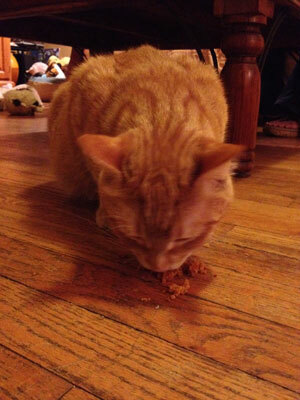 And then she made me share with Sazerac. Oh, the injustices I endures. 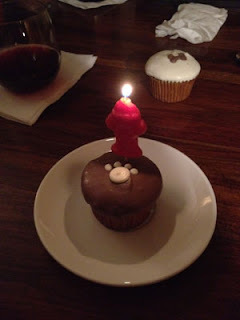 Even though I had to share my pupcake, it was a really fun birthday. Mom said we's gonna go have some more fun this weekend with some of my pug friends. I can't wait to see what we's gonna do! We know it's been a really long times since we's said hello to all of you. We's gonna try to be better next year. A lot has been going on in my home. I got this new baby - and he's growing fast! He's also kinda becoming a pain. Now he jumps on my head and tries to play with me whenever he wants. Even when I'm trying to sleep! 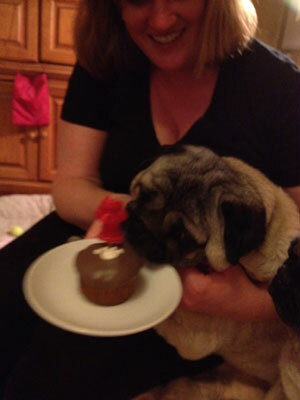 Mom knew I needed a break so last weekend she took me for a very special treat. First, let me mention that Harry was going to the spa for a de-stinking and an "expresso". 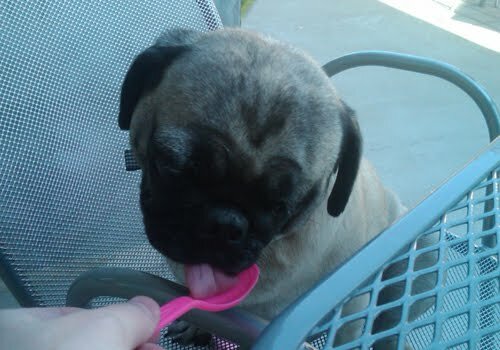 So while he was doing that, me and Mom went across the street for some yogurt!!! I'll have strawberry and vanilla, please. Oh, and can you throw in some graham cracker crumbs? Thanks! Any of you have special treats lately? If not, these yogurt places are popping up like prairie dogs all over the place! I suggest your people take you there post-haste! Tallulah Tuesday - My Kitten! I know my big brother already spilled the beans, but I have a kitten!!!! His name is Sazerac Six-toes (cause he has six toes on his front paws) and he's all mine! Tomorrow will be three weeks since he came to live with me. He loves it when I play with him - and I love to play with him! Here's some video of us playing. He also loves to snuggle with me and sometimes he even tries to give me a bath! I know, that's kinda silly but I guess he thinks I'm his Mama or something. I hope you're all having a good week and I really recommend getting a kitten if you don't already have one. They're lots of fun!